At Greylock, my partners and I are driven by one guiding mission: always help entrepreneurs. It doesn’t matter whether an entrepreneur is in our portfolio, whether we’re considering an investment, or whether we’re casually meeting for the first time. Entrepreneurs often ask me for help with their pitch decks. Because we value integrity and confidentiality at Greylock, we never share an entrepreneur’s pitch deck with others. 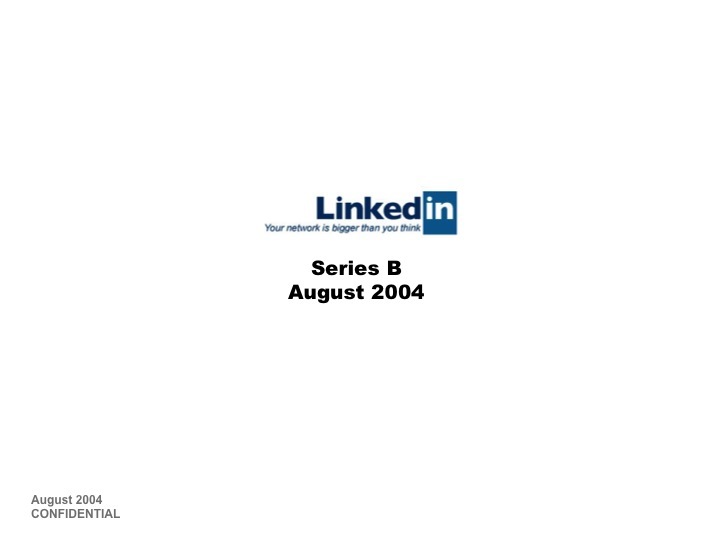 What I’ve honorably been able to do, however, is share the deck I used to pitch LinkedIn to Greylock for a Series B investment back in 2004. This past May was the 10th anniversary of LinkedIn, and while reflecting on my entrepreneurial journey, I realized that no one gets to see the presentation decks for successful companies. This gave me an idea: I could help many more entrepreneurs by making the deck available not just to the Greylock network of entrepreneurs, but to everyone. In 2004, the consumer internet was just beginning to rebound. Friendster was at its height, strongly battling MySpace after raising its premium round from Benchmark and Kleiner in the fall of 2003. Facebook, by the way, was not yet on most people’s radars in the summer of 2004. Investors see a lot of pitches. In a single year, the classic general partner in a venture firm is exposed to around 5,000 pitches; decides to look more closely at 600 to 800 of them; and ends up doing between 0 and 2 deals. The goal of an entrepreneur is to be one of those deals. First, understand your audience. Research prospective investors thoroughly. What kinds of businesses are they looking at? What model/criteria/triggers do they use to judge whether a project will be successful or not? If you don’t have some sense of their points of view, your likelihood of making the pitch go well is more random. You may happen to emphasize the right points that pique an investor’s interest, but you shouldn’t leave your financing up to chance. Second, understand the broader financing climate. In 2004, investors regained interest in the consumer internet again. Friendster raised a big round in 2003; MySpace started gaining traction. But with so many investors still licking their wounds from the dot-com bust, many focused on proven business models, such as advertising or e-commerce. As a result, we knew that our pitch would need to steer into investors’ biggest concern: the lack of revenue. What is LinkedIn? The graphic we chose emphasizes that it is a network of people. Why is it valuable? Because you can find and contact people you need. How is this different? 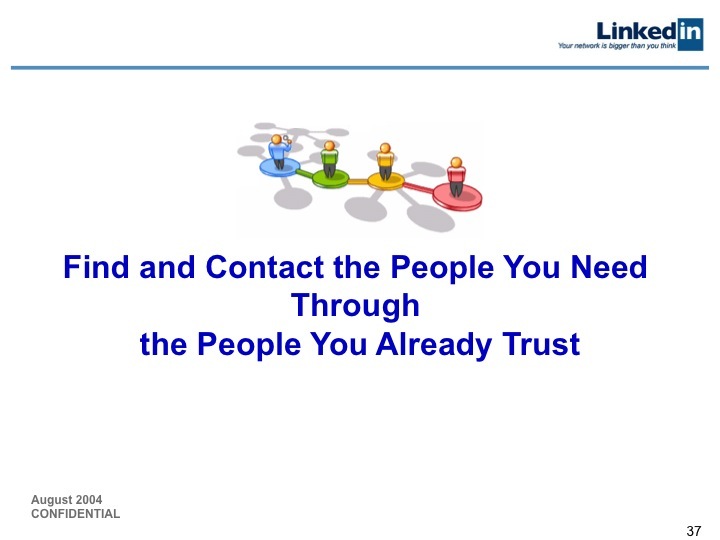 Because unlike Google search or other means, it involves people you already trust. If we framed LinkedIn as only a “jobs/classifieds” website, most smart venture capitalists would not have invested because that seemed to lack the potential to be a broad platform that could sustain a large business. 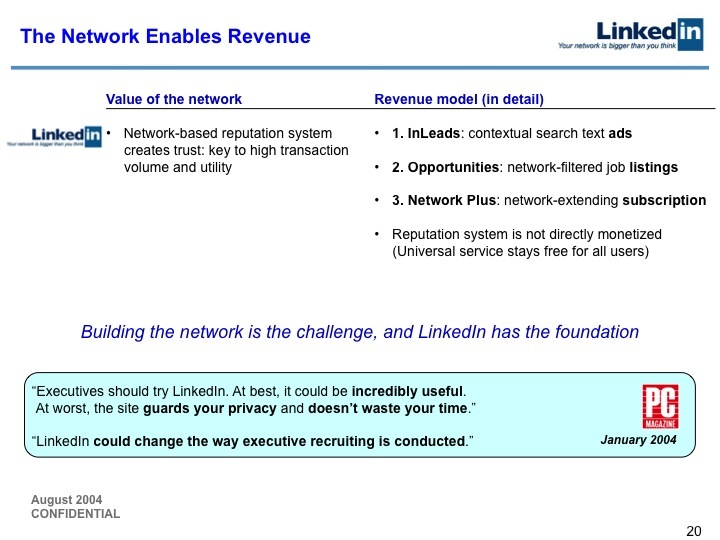 Ultimately, Greylock’s investment thesis was that LinkedIn would be a great recruiting business with an option for more. Open with your investment thesis, what prospective investors must believe in order to want to be shareholders of your company. Your first slide should articulate the investment thesis in generally 3 to 8 bullet points. Then, spend the rest of the pitch backing up those claims and increasing investors’ confidence in your investment thesis. Massively valuable properties will be built off networks. There will be different networks for different domains. The professional domain will be one massively valuable network. We are the leader in the professional domain with viral growth. Great businesses can be built off this network, starting with matching talent and opportunity. It’s a network effects business, which means it has inherent defensibility with a network. Clearly articulate your investment thesis so investors can offer feedback that helps you refine it, eventually getting to a place where you both agree on it. Any disagreement will likely cause serious problems down the road. 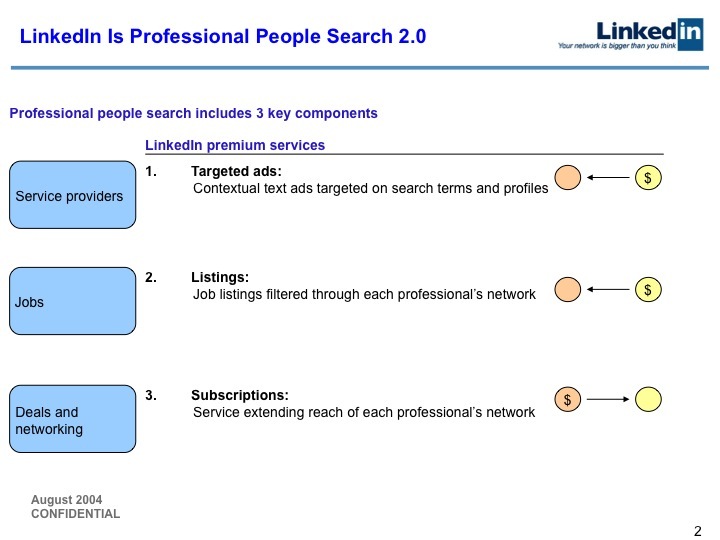 Normally, you’d expect us to explain our product — i.e., what “professional people search 2.0” is. Instead, our strategy was to steer immediately into the revenue question because that was the top concern of investors in 2004. And remember, LinkedIn was a consumer internet play with moderate consumer traction and without a dime of revenue. To show potential revenue streams, we listed three products: ads, listings, and subscriptions. The blue boxes identify the corresponding markets for those products. Although the blue boxes are equally sized, we knew that the largest portion of our revenue would come from the recruiting space (the 2nd blue box labeled “Jobs”). The principal market for our listings and subscriptions products became the recruiting space, instead of business development and networking. Subscriptions became the product with the highest dollar volume faster than expected. Today in 2013, the majority of LinkedIn’s revenue comes from an enterprise version of our subscriptions product. The general rule is one business model drives the business. It’s tempting to list multiple revenue streams because you’re trying to prove that you will be big. Yet when consumer internet companies do this, investors generally see a red flag. The charitable interpretation, which was true in our case, is that the company’s team doesn’t know which one model will work. The bad interpretation is that the team lacks focus and doesn’t understand that they generally need to drive to one business model to succeed. We made the mistake of listing three different revenue streams. As it happened, we did end up pursuing all three lines of business. And LinkedIn proved to be an exception to the rule of thumb: our diverse business lines have been a strong plus. General rules sometimes have important exceptions which can be tremendously valuable. That’s true in business strategy, entrepreneurship, and even pitch advice. With the revenue question out of the way, we were ready to explain our product. We had two questions to answer: What is the product? And why is it new? 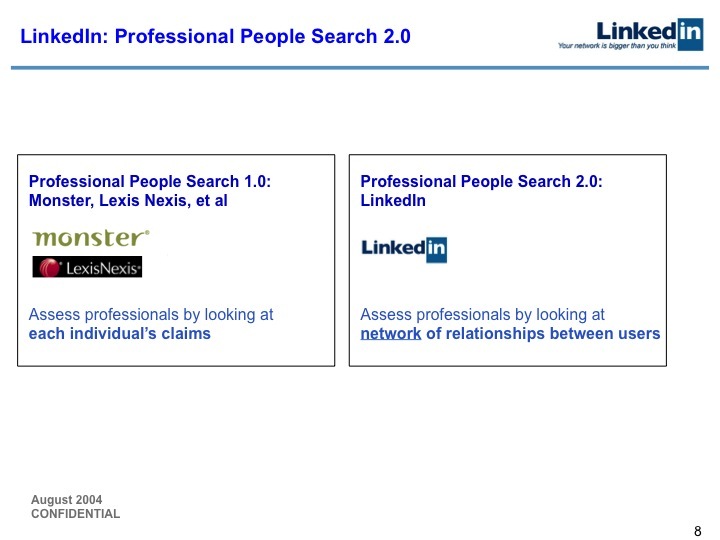 We argued that the way professional people search was done at the time (“1.0”) was inadequate. To make this argument, we listed three important professional business problems (finding service providers, finding job candidates, and reaching professionals) that were time-consuming and difficult to accomplish with existing technologies. In the yellow pages, people wanted to be found but the way they represented themselves had nothing to do with how good they were. In old-school resume databases, most talented professionals didn’t want or need to participate. In directories, professionals only wanted to participate if other talented professionals did, too. So, how do you create a platform where talented professionals can participate, be found, and be contactable? Our answer: a network. A network solves this problem because all of their friends and contacts would be on it — and friends of their friends. Creating the right incentives and reputation system would lead to a directory people would be a part of. Steer into your investors’ objections. There will be one to three issues that are potentially problematic for your financing — address them head on. You have the most attention from investors in the first couple slides. Most investors arrive with questions, and if you proactively show you understand their principal concerns, you earn their attention for the rest of your pitch. For consumer internet properties in 2004, because we had just gone through the dot-com winter, investors’ principal concern was whether or not you could make money. As you recall, we began our pitch by steering into the revenue question because we didn’t have tens of millions of users or a growth curve off the chart; otherwise, we would’ve started with one of those. In 2013, it’s whether you can break through the noise. Today, there are probably a thousand consumer internet startups founded every quarter — how do you become one of the 1 to 3 that matter in a 7-year timeframe? Those are the kinds of objections you need to steer into at the beginning of your pitch. The network provides the platform for a new kind of people search, which can be a platform to many other businesses. In order to believe that LinkedIn was a good investment, our investors would need to believe that there was a broad trend of moving from directories to networks (1.0 to 2.0), that networks could become hugely valuable, and that a LinkedIn people search application on a network would be a valuable asset. 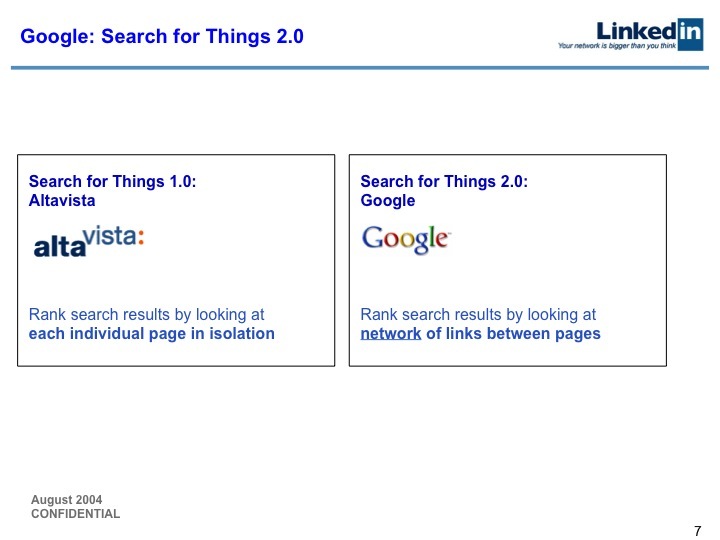 We may have been the first folks talking about “the internet 2.0” back in the summer of 2004, though Tim O’Reilly later popularized and deepened the meaning of the phrase. Show, don’t tell. Again, your pitching goals are to increase investors’ confidence in your investment thesis and lead them to a shared view of your company’s problems. To accomplish this, you should show rather than tell whenever possible. The winning moment for an entrepreneur is when an investor concludes on their own volition that an investment thesis is worthwhile, rather than having the entrepreneur tell them what to conclude. For early stage companies, it’s important to show that you’re on path, that you have prospects, and that you can get to your vision. 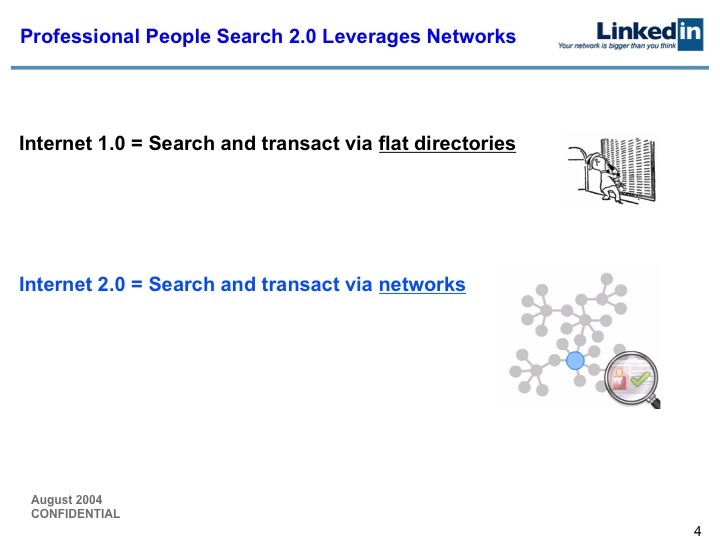 Once investors believed that professional people search was valuable, the next question was whether internet 2.0 (the move to networks) amplified that value considerably. To demonstrate this, we showed how the 2.0 transformation created value in other markets. Pitch by analogy. Every great consumer internet company grows up to be a unique organization. But in the early days, you want to use analogies to successful outcomes to describe what your company is and what its potential could be. Time is short — it helps to refer to what those investors already understand. The best pitch I know was in Hollywood for a film called Man’s Best Friend. The pitch was “Jaws with Paws”. Investors thought that if the movie Jaws was a huge success, maybe a similar premise on land with a dog could be a huge success. The movie turned out to be terrible, but the pitch was excellent. Next, we looked at online payments. 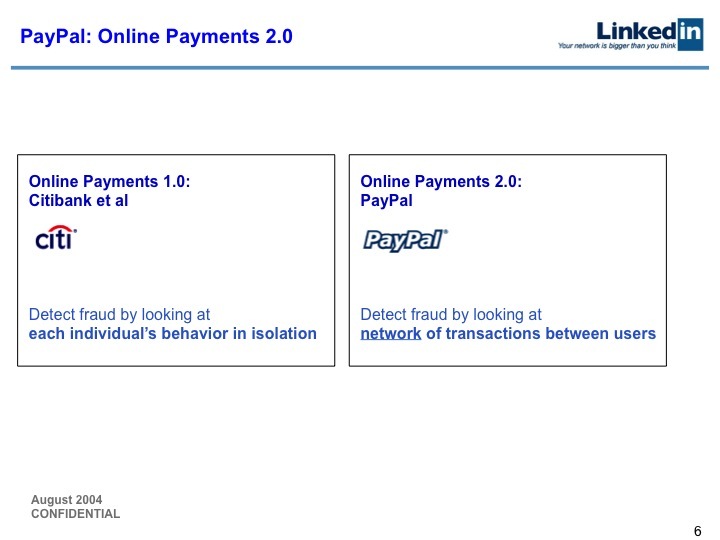 Although online payment transfer already existed with banks, PayPal’s model of a network of payments is what made it unique. The problem we chose for this example was fraud. It is difficult for banks to detect fraud because they don’t have access to the whole payments network; they only have access to individual nodes in that network. Another reason we used PayPal as an example was to remind investors that I was part of PayPal’s founding team — a minor example of showing, not telling. Understand where analogies apply and where they do not. Pitch by analogy but don’t necessarily reason by analogy. Reasoning by analogy, when you’re developing your business strategy, is dangerous. In startup land, you’re running across a minefield, so the details matter and you have to be careful with your analogies as you conceive strategy. In fact, when I’m the investor listening to a pitch, one detail I consider is whether the entrepreneur is being too deluded by their analogies and not thinking hard enough about exception cases. In our third example, we contrasted Altavista and its search algorithm versus Google and its search algorithm PageRank. PageRank is one more use of networks: search results that leverage an overall network of pages rather than just rely on the occurrences of terms. When pitching by analogy, anchor your business to other valuable businesses to signal that your business will be valuable, too. 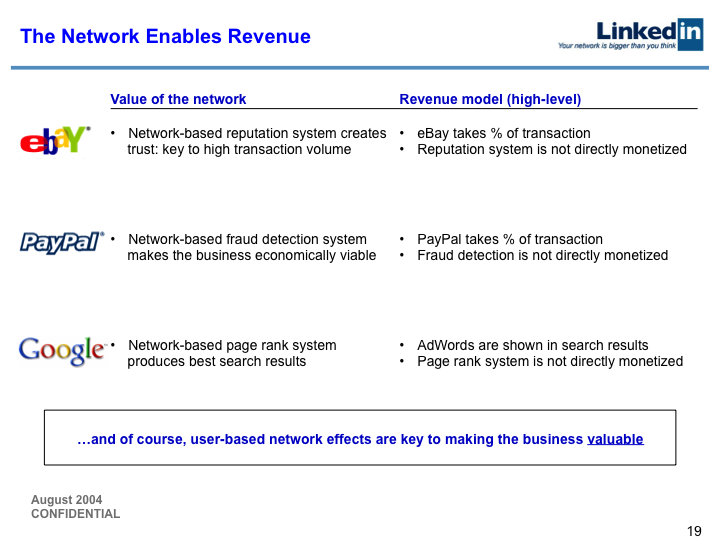 Our underlying argument was that the network enables revenue. To make this point, we showed how networks enabled revenue for eBay, PayPal and Google — three companies that anyone would’ve wanted to invest in. 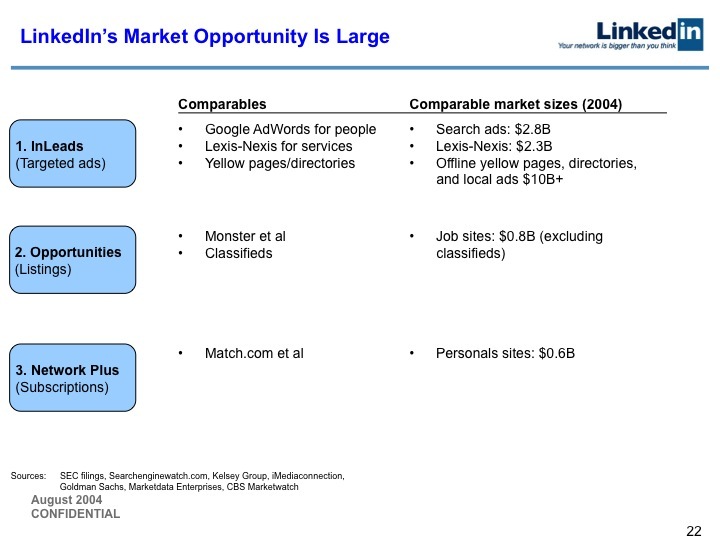 Finally, we contrasted LinkedIn against both Monster and LexisNexis because we wanted to show that LinkedIn would add value to all valuable applications related to professional people search — e.g., recruiting (represented by Monster) and service directories (represented by LexisNexis). 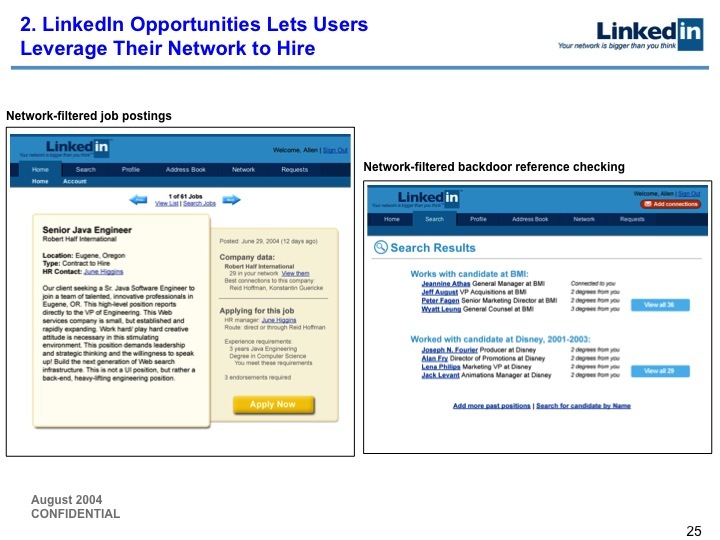 LinkedIn would create a networked resume document — a resume 2.0 — instead of traditional job listings with private resumes. When you’re finding people on LinkedIn, you’re finding them through a network as opposed to a resume database. We also knew that networks would improve information reputation systems, allowing people to find the best possible information. Today, networks underlie the information reputation systems of many consumer internet companies, including LinkedIn, Facebook, and Twitter. Avoid debating the validity of your analogies. If someone pushes back and tries to challenge elements of an analogy, don’t let yourself get drawn into a back and forth. Analogies are a conceptual framework, so they’re not going to be 100% accurate. However, so many entrepreneurs try to pitch by analogy that some investors have fatigue when they see it. If you have a good analogy, use it. But if you don’t have a good one, don’t include one just to have one. It’s better to have no analogy than a bad one. Here, we remind investors that this investment decision comes down to whether or not they believe that a network creates huge value. Even though we knew we would monetize, we argue that investors shouldn’t be thinking about our current revenue numbers. Instead, they should think about the network we established because that’s what ultimately wins. We spent our Series A capital building the network, so we needed investors to agree that the network was more important than revenue. Because our investment thesis was ultimately unprovable, the argument we made in slides 5 through 9 is one of the strongest parts of the presentation. Any good idea has legitimate reasons why it won’t work. In order to achieve real success, you need to be contrarian and right. During LinkedIn’s Series A, when we pitched the importance of building the network, the classic objection was that the network wouldn’t be valuable to the first members, so why would it grow? For the first 500,000 or so members, the value of the network is zero. What I knew that many didn’t was that a combination of curiosity and a viral game mechanic would slowly get to a million people, at which point the network becomes valuable. During LinkedIn’s Series B, Greylock’s bet was that LinkedIn had good prospects to transform the recruiting industry, and that if we built up a broad professional platform, we could potentially do much more. 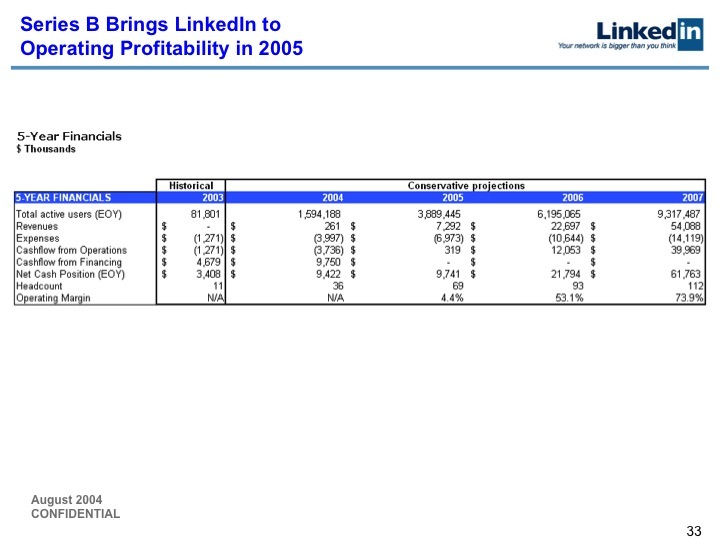 Greylock invested in LinkedIn at roughly $0.60 per share. When you compare that to our current public market prices, you see an example of “contrarian and right” venture investing. In slides 10 and 11, we compared what we promised in our Series A pitch with what we actually did. Our overdelivery against our Series A predictions provided strong evidence to new investors that we could execute against our plan. 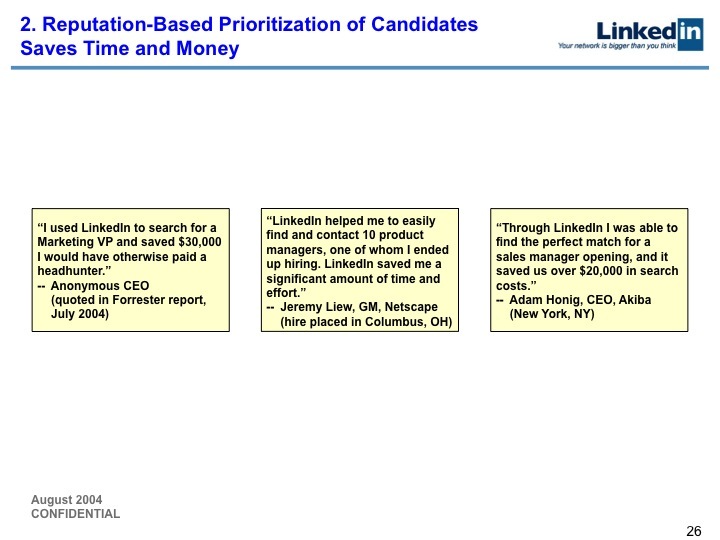 LinkedIn’s Series B was a concept pitch because our data at that point wasn’t impressive. At the time, Friendster had about 10.5 MM users and MySpace had 2.5 MM users. 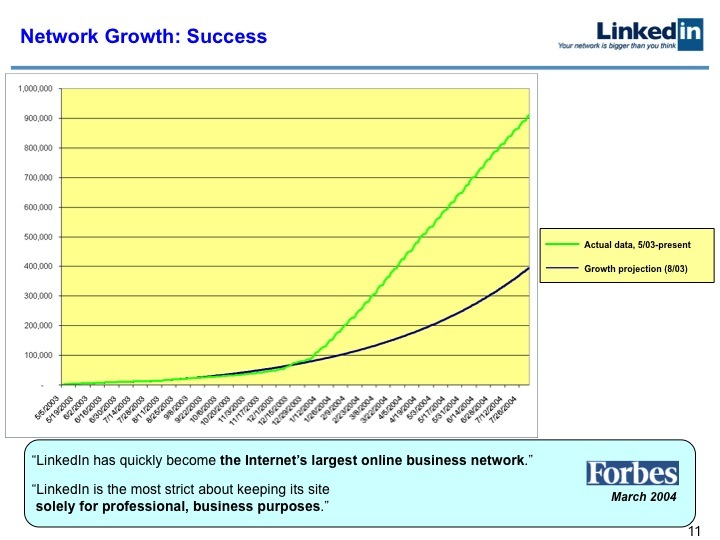 LinkedIn, at the time, was still approaching its first million users and did not have a dime in revenue. Your investment thesis is either concept-driven or data-driven. Which kind you are pitching? In a data pitch, you lead with the data because you are emphasizing how good the data already is. Investors therefore evaluate your company based on the data. 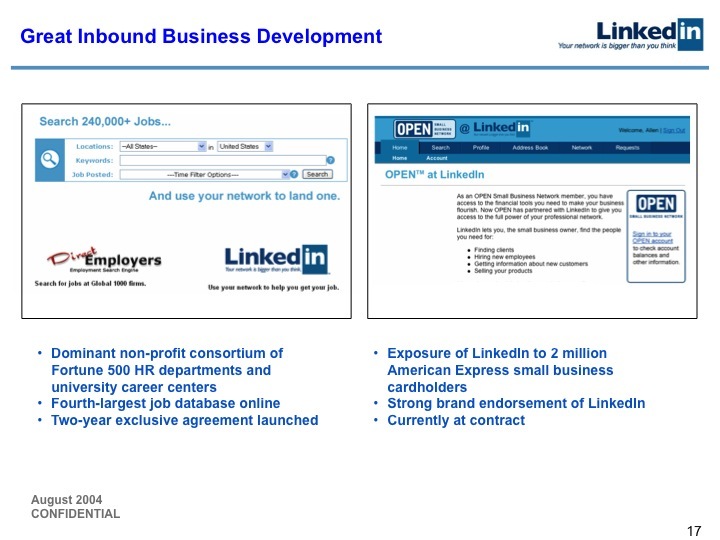 When LinkedIn went public, it was a data pitch to public market investors. We showed investors a multi-year track record of data. If it’s a concept pitch, on the other hand, there may be data, but the data supports a yet undeveloped concept. A concept pitch shows your vision for how the future will be and how you will get to that future, so investors will want to buy a piece of it. Thus, concept pitches depend more on promised future data rather than present data. When you’re doing a concept pitch, it’s especially important to consider pitching by analogy. The professional space is valuable, even if you think it’s less valuable than other spaces. 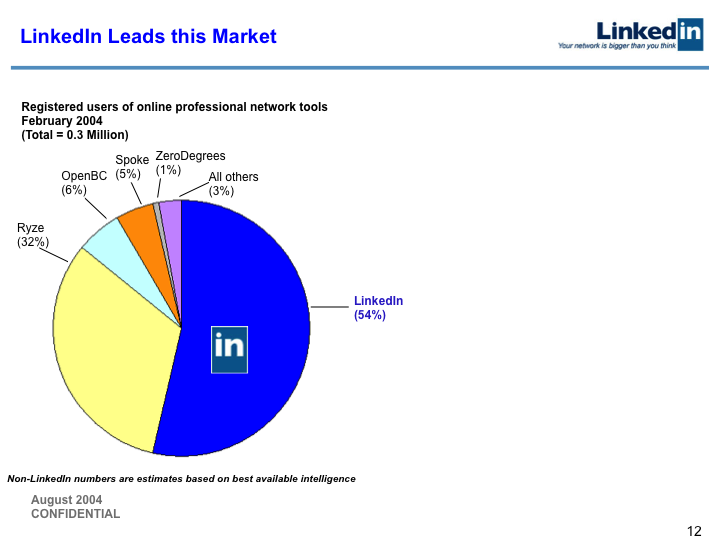 LinkedIn can provide the best product and be the strong market leader in this space. We have evidence that we’re en route to market leadership. 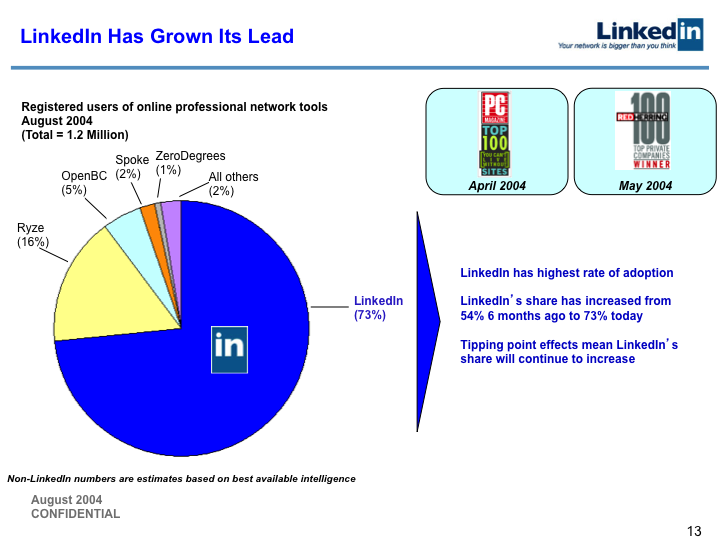 Back in 2004, each of these companies had a counter-pitch to LinkedIn: Ryze had a lot more active, engaged users. OpenBC had higher activity rates and revenue per user. And Spoke had more comprehensive data because they were uploading entire address books. In contrast, we argued that the growth of the network was the key variable, which turned out to be right. As LinkedIn grew, so did our competitive edge, as more and more members invested activity and data into our network. Today, LinkedIn has a substantial amount of user trust with its members, who give us permission to use their data because they have the right control over their data and because they voluntarily participate in our network. One ingredient this pitch lacks, which I now think is essential to modern pitches, is our risk factors. Experienced investors know there are always risks. If they ask you about your risk factors and you can’t answer, you’ve lost all credibility because they assume you are either dishonest or dumb. Dishonest if you’ve thought about the risk factors but choose not to share them, which is a bad way to build trust and a partnership. Dumb if you aren’t smart enough to understand that all projects have risk factors — including yours. Explicitly identify the risks that could thwart your success and how you will mitigate them. And instead of waiting until investors ask about your risks, share them proactively so you build trust. 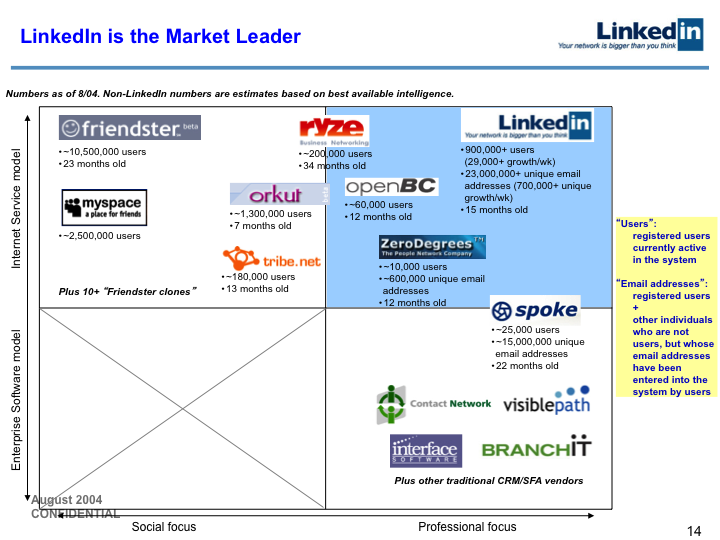 Our investors didn’t need to worry about the top-left quadrant of competition (Friendster, Myspace, Orkut, and Tribe.net) because those focused on the social side, which we asserted was an entirely different space from LinkedIn’s professional space. Our investors didn’t need to worry about BranchIT, Visible Path, etc., because those mostly focused on enterprises instead of individual professionals. Instead, what investors should have paid attention to was the companies in the blue box — Ryze, OpenBC, ZeroDegrees, and Spoke. If investors agreed, their next question was usually “What’s your competitive strategy in each case?” We thought we had a viable competitive strategy in each of these cases. Entrepreneurs often say they have no competition, assuming that’s an impressive claim. But if you claim that you don’t have competition, you either believe the market is completely inefficient or no one else thinks your space is valuable. Both are folly. The market is efficient, eventually — if a valuable opportunity emerges, others will discover it. To build credibility with investors, you want to show that you understand the competitive risks and show why you’re going to win. Express your competitive advantage. Why are you going to break out of the pack? What is your advantage? An understanding of product-market fit? Is it a technology advantage? What’s your differential business strategy? Your differential growth strategy? Your differential product? If you aren’t clear and decisive, investors won’t believe you have an edge that can lead to success. This slide is a testimony to our nervousness about our organic growth compared to Friendster and MySpace. Again, because this pitch is a concept pitch, we wanted to convince investors to bet on our future. Thus, we wanted to show successful organizations that were committed to our success. This is mostly a mistake slide because customer slides are more appropriate for enterprise pitches. Great customers are predictive of future customers for enterprise businesses. On the consumer internet, however, this is a sign of trouble because it indicates that the entrepreneur may not understand how the consumer internet works. Generally speaking, consumer internet businesses need grassroots and individual adoption rather than organizations promoting it. Although we knew this at the time, we violated it because we were nervous about our adoption and because we thought we might be a unique exception. To bring home the argument that investors should believe in us in the future, we show what we accomplished after spending the majority of our Series A $4.7MM financing. As I said earlier, you want to show focus in your decks by emphasizing what you’re really betting on. However, show some maneuverability. Don’t just say that you have five different options. Instead, say that you’re doing one, but you also have some fall-back or maneuvering options. 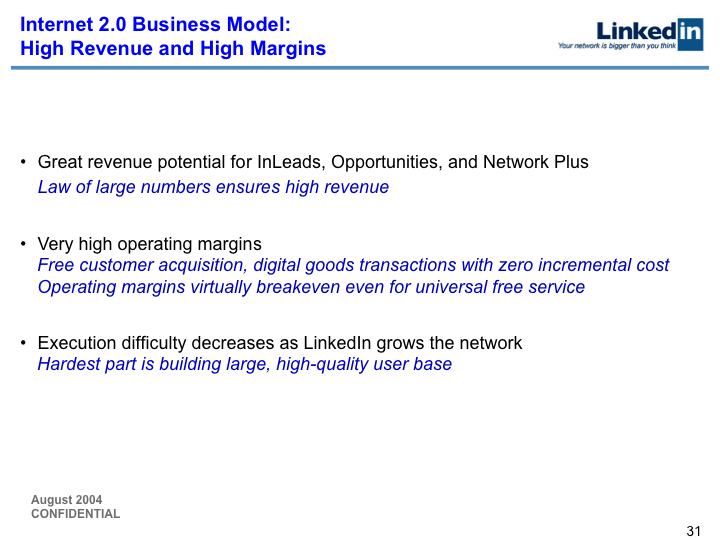 For example, if we were doing the Series B pitch in 2004 with my knowledge of today, we would emphasize that LinkedIn would start by transforming one business — the recruiting industry, by shifting it from a posting model to a searching model. Then, in our talking points, we would highlight some of the other businesses we can transform with our platform. “Invest in A, but here’s B to show that we could contain that risk.” Investors would appreciate this because you’re identifying a reasonable risk and demonstrating that you have actually thought about what you would do if the primary plan doesn’t play out as you expect. 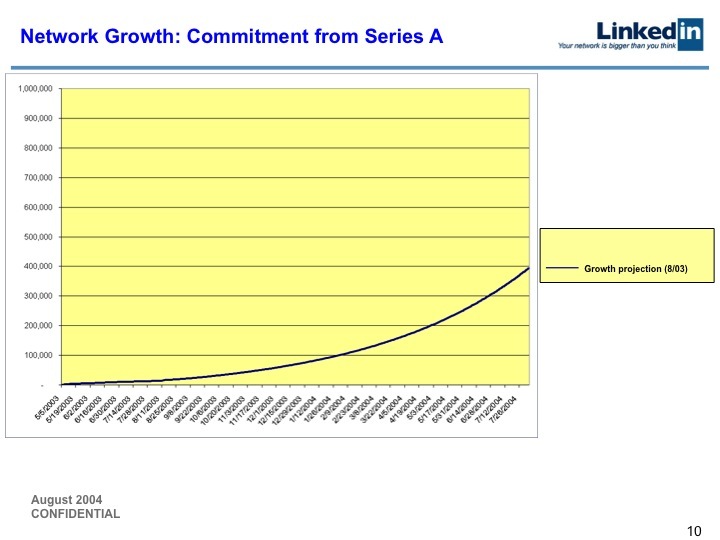 One purpose of this slide was to hedge our bet on getting growth. If an investor thought none of the numbers in the prior slide were good enough, we added business development as an additional factor. The other purpose of this slide was to demonstrate market leadership by showing that important organizations were coming to talk to us. Ultimately, neither of the two deals shown above ended up delivering substantive value. It’s always better to have less slides, but it’s much more important to have a great deck. A great deck needs to address all important concerns and tell your story effectively. Sometimes, that means setting up a narrative over several slides. Don’t stress about the exact number of slides. Entrepreneurs often hear advice that their decks should be a particular length. I, for example, recommend a length of 20 to 25 slides. But these are only rules of thumb, which means you can violate them if you have a good reason. 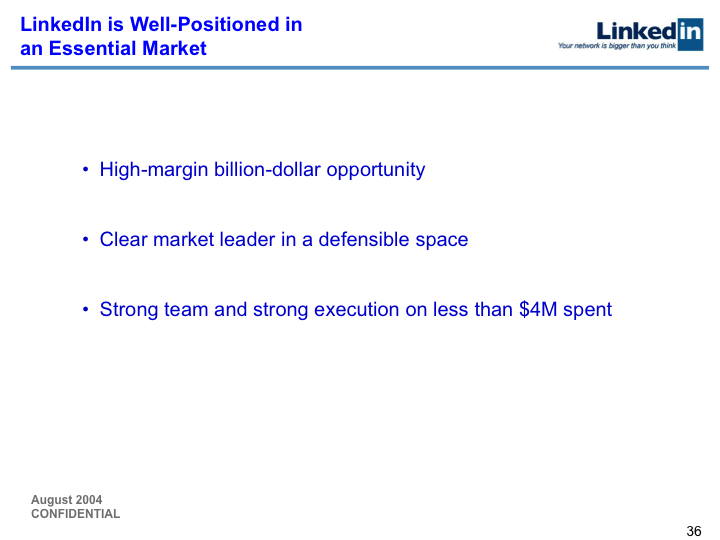 LinkedIn’s Series B deck contained a couple slides that we spent little to no time talking about, but we included them because they had information that showed investors we had thought about all the important details. Even though we glossed over those slides, investors knew they could come back to those slides later and dig into them if necessary. A network-empowered people search application could be really valuable. We are the market leader in establishing the network. We have a viable plan for establishing revenue off the network. 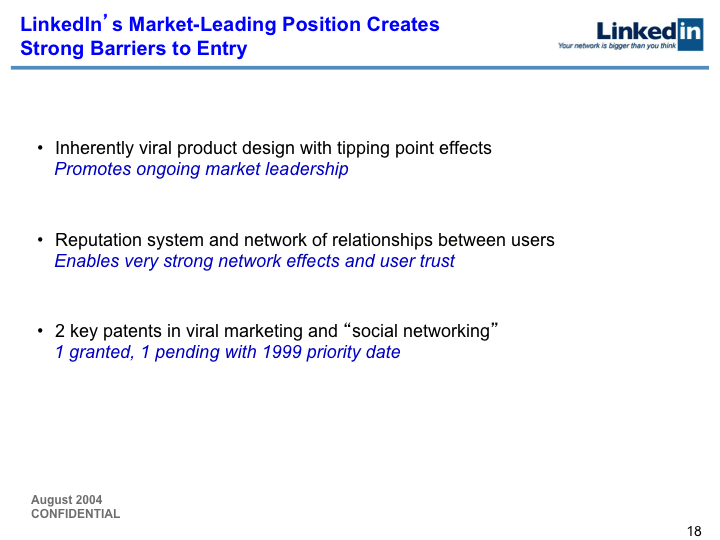 Here, we argue that we have a viral product that creates a network that possesses network effects. We didn’t try to establish the viral dynamic; we just asserted it. I explained more of the strategy in person, but we also didn’t want to cover it much in writing because virality was a pretty deep secret in the industry at the time. Today, given that virality has achieved buzzword status, you usually have to show evidence that you know what virality is and how it works. Surprisingly, there are still few people who understand virality. When pitching VCs, think about the individual partner in the context of their partnership. Make sure the individual partner has strong cohesion and trust with the partnership and is responsible for your type of business.In the financing process, the individual venture partner performs the due diligence on the substance behind a company’s pitch — e.g., the investment thesis, the competition, the people, etc. The partner then asserts the investment thesis and why they believe it to the partnership. Ultimately, you’re selling the partnership, so give the individual partner the talking points to be successful. What will that partner tell their partners? Put yourself in their shoes. Earlier in the pitch, we argued that establishing the network was our first priority with our Series A. Our Series B, however, was about getting to revenue, so how were we going to do that? Before we detail our revenue plans, we remind investors why the value of the network created good businesses across eBay, PayPal, and Google — our previous examples of network-enabled 2.0 businesses. Each example generates considerable revenue out of the network despite not charging people to be in the network. Each example has a network powering its revenue-generating applications. You don’t pay for the eBay reputation system; you pay for the transaction. You don’t pay for PayPal’s fraud system, but the fraud system enables those transactions to go through or not and to be profitable. You pay for AdWords, not the regular search results. People frequently think the most fundamental strategy of a startup is its product strategy. In fact, the most fundamental strategy is the financing strategy. If your company runs out of gas (finance), your company will die no matter how good your product strategy is. Frequently, the product/service strategy is harder to develop, but the financing strategy should be there first. 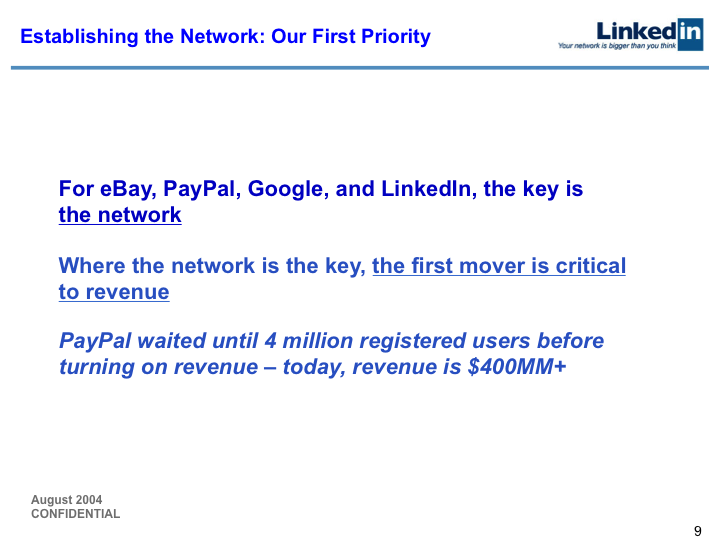 To this point, our conceptual argument for getting to revenue was this: Just as networks enabled revenue across eBay, PayPal, and Google in the previous slide, the network will enable revenue for LinkedIn, too. But we also had a concrete plan, which we began detailing in this slide. Always think about the next round. The usual tempo for raising money from venture capital is at a minimum of a year between financings. Every time you raise a round, you should be thinking about the next round. Who will be the next investors you pitch? What will their concerns be? What will you need to solve next? How will you raise money later? Expect that future investors will look at today’s deck. When I created our Series A deck, I presented a growth curve that would be good enough to get an investment, but I also had confidence that I could beat it. I wanted to be able to go into my Series B presentation and say, “Here’s what I said before, and here’s how I did.” Because we beat our Series A expectations for network growth, investors could comfortably trust our promise to build revenue with our Series B financing. Above is another version of saying that we built a network and it’s time to build the revenue. 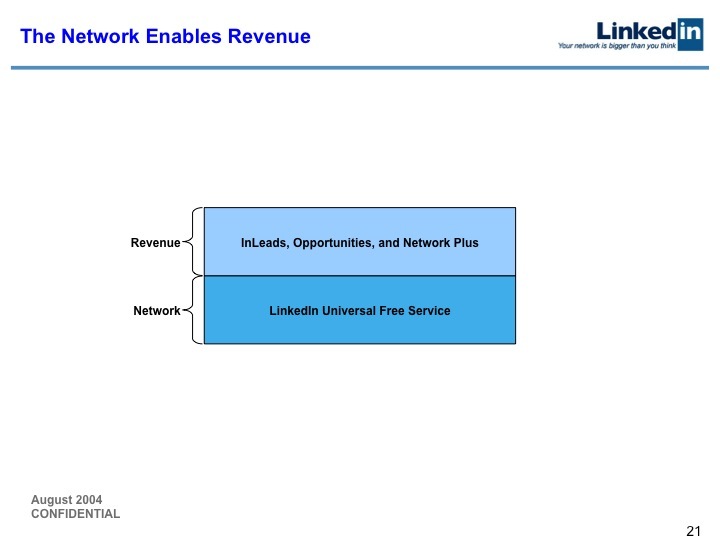 To some degree, this is somewhat an empty placeholder slide, but as the last slide in the “network enables revenue” sequence, it provides a clear visual for understanding the concept. I’m not sure I would keep this slide in retrospect; however, I remember that we talked to it well. Reinforce key concepts when delivering a concept pitch. Diagrams are one way to accomplish this, helping investors visualize key concepts. In our pitch, we wanted to make sure investors understood that you build the network first and then you can build a platform of businesses on top. It’s helpful (but not mandatory) to put your thesis in each of the titles. If an investor sequenced through the titles, they’d be able to get a sense of the flow of the argument. This is especially helpful when investors are sharing the decks with their investment partners. Investors frequently ask, “What’s an existing business that’s like your business that you could occupy?” This is why many entrepreneurs include a slide about their Total Addressable Market (TAM), the underlying revenue opportunity for a product or service. 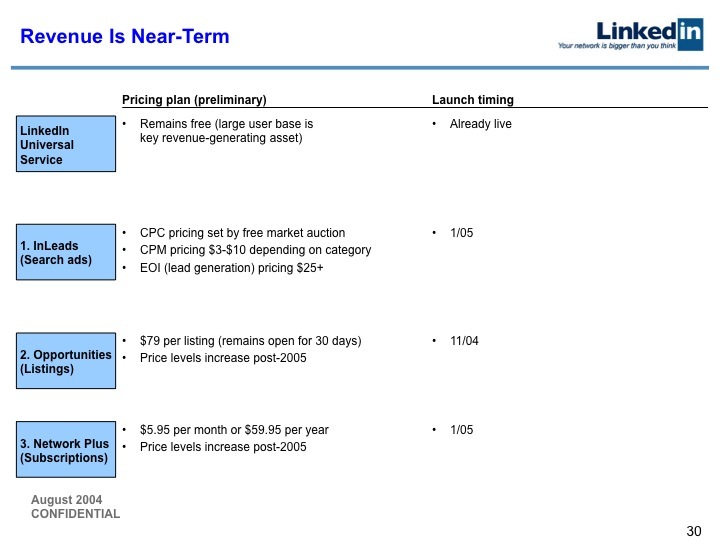 Smart venture capitalists saw that we had interesting comparables, but didn’t spend much time on this slide. The more important question was whether they believed we could build out these products. As a historical note, we spent some time thinking about search ads, but realized we couldn’t really make it work. 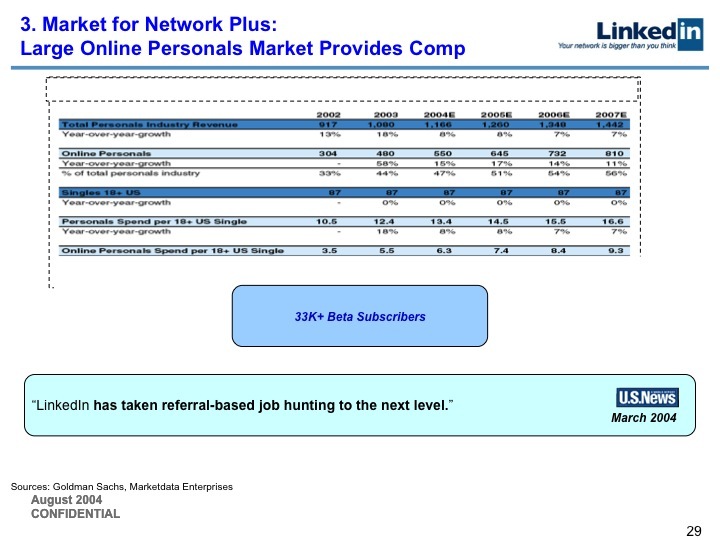 The first product we launched was job listings, then subscriptions which was called Network Plus. Network Plus ended up being targeted at networkers and outbound professionals, who were then willing to pay more money per person. It wasn’t for every professional; it was for professionals with outbound needs. Show a focus on bottom-up tactics for your strategy. And show that you’re focused on the metrics that matter: revenue numbers, engagement traction, etc. Frequently, young entrepreneurs put in slides that show their business’ total addressable market (TAM) to establish some credibility. Problem is, most investors don’t trust the sources of that information, so entrepreneurs aren’t establishing huge credibility by saying they’ve claimed a market with a huge TAM. TAM slides quote people who have incentives for artificial inflation, so entrepreneurs risk demonstrating that they have no real sense of how to take dominance of the market. If you do choose to include a TAM slide, don’t linger on it because lingering says that you don’t really understand that the game is played bottom-up, not TAM-down. Above is a mockup of how InLeads, a product that wasn’t built yet, could work. 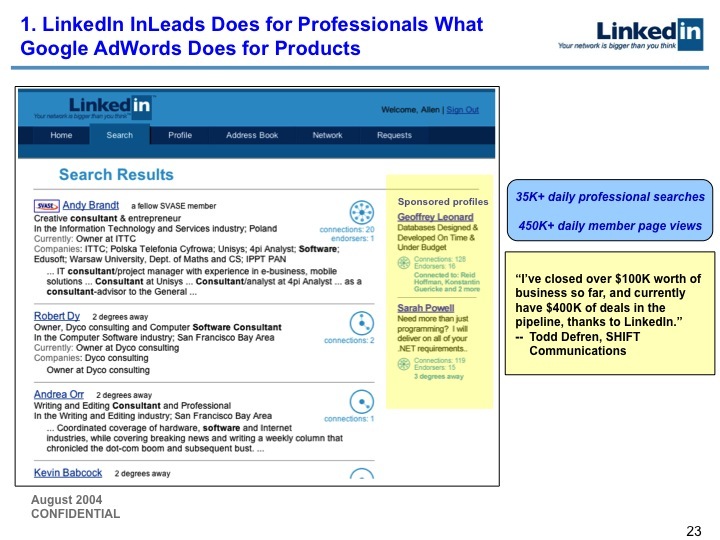 The point was to demonstrate why people would pay for a listing on LinkedIn as opposed to just buying Adwords. We only used inLeads as a brand in this deck. By the time we got around to building our Marketing Solutions business, we had a different concept of advertising than InLeads. Show your product rather than saying you intend to build a best-of-breed product. Ideally, you want to have the product built. Otherwise, you should show what you have in mind with a mockup. A mockup is better than nothing because it increases investors’ confidence by showing that you’re thinking concretely about the product and allows them to evaluate your plan. We included this slide because of the analogy to Google’s Adwords, which was and is the most amazing of the internet businesses thus far. Obviously, there are many ideas that are conceptually possible at LinkedIn, but we didn’t build InLeads because the search traffic wasn’t high enough to get the ecosystem going at the time. When in doubt, lead with what will make the most sense to investors. 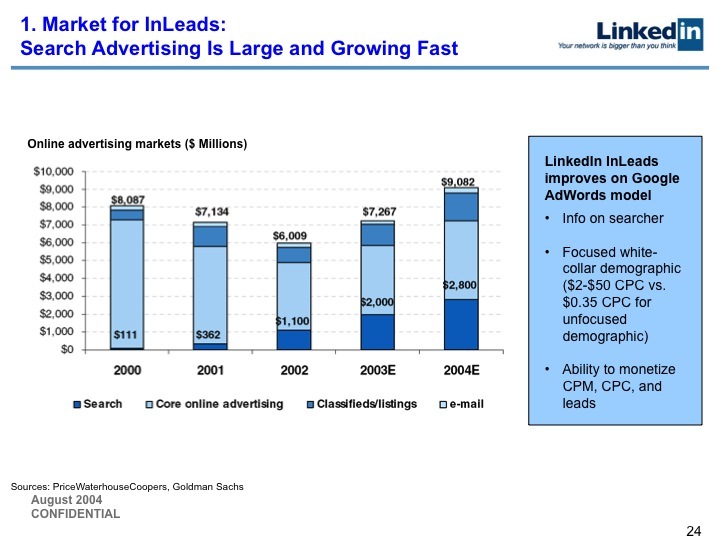 We never launched InLeads, but we led with it because in 2004 everyone understood that AdWords was a golden goose. Since we weren’t decided on the exact sequencing of our revenue plan, we led in the pitch with the one whose value proposition could easily be understood by investors. The above mockup reinforces the idea that a network overlay improves job postings and reference checking. For example, the network enables job seekers to get introductions to people in the group they’re being hired into, or to people who could talk to that hiring group, or to the hiring manager themself. The network enables job seekers to reference check whether a company is a good place to work, or find someone to perform an informational interview with. Fast forward to 2013 and most people recognize that LinkedIn has a pool of professional identities/CVs/profiles, but they don’t fully recognize how deep the reference checking capabilities of our product is. You can use the information on LinkedIn to identify referential information, allowing you to prioritize whom you’re reaching out to. You can reference check a wide variety of professionals — including domain experts and service providers — both before and after you meet them. Plus, it goes in both directions — employees can reference check prospective managers, and managers can reference check prospective employees. The difference between a great, a good, a mediocre and a bad hire are enormously disastrous in term of potential impact on your business. Improving the quality of hires or increasing the speed of the hiring process saves professionals time and money. That’s a worthy value proposition. In concept pitches, you’re selling a story, so naturally there will be people who don’t believe that story. That’s okay because you don’t need everyone to believe it; you only need the right people to believe it. Naturally, you want everyone to think your business is amazing, but don’t get deluded by that. Startup financing is not a popularity contest; everyone saying yes is irrelevant to you. It’s more important to have the right person say yes than it is to have everyone say yes. The best outcome is an investor who can help you build the company and realize a market opportunity. Put another way, the ideal financing partner is a financing cofounder. This is why already-wealthy entrepreneurs raise money from experienced investors for their next startup: they know partnering with angels and venture capitalists is about more than just the money. Sadly, many investors actually add negative value, so an investor who adds no value (“dumb money”) but who doesn’t interfere with the operational process can sometimes be a decent outcome. But ideally you find an investor who can proactively add value (“smart money”). How do you know if an investor will add value? Pay attention to whether they are being constructive during the financing process. Do they understand your market? Are their questions the same questions that keep you up at night? Are you learning from their feedback? Are they passionate about the problem you’re trying to solve? This slide is overkill, and in hindsight I would delete it. We were trying to show rather than tell investors that our job listings product would have customers by displaying customer feedback. 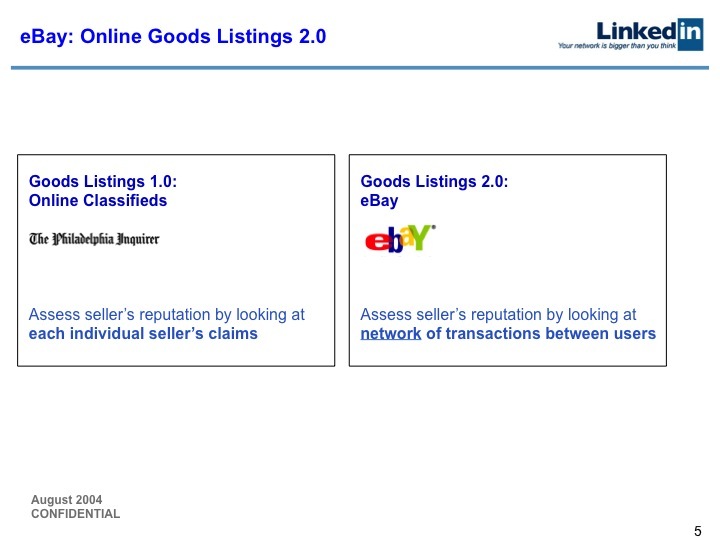 We used quotes as evidence of product-market fit, showing that there were people who would actually use the value propositions of our network-based listings. But this was a weak effort. If investors didn’t already believe this, this slide did not help. And if they do believe, this slide did not increment their belief. Internal data is preferable over anecdotal third party data. Since we didn’t have data to back up various assertions about our product-market fit, we had to rely on quotes from customers and press sources, which weakened our pitch. Although using quotes wasn’t particularly helpful in our pitch, it is important to always be talking with smart people to solicit their feedback. Talk to your network to evaluate your ideas and evaluate your pitch. Half the time, the feedback is irrelevant — even smart investors may not understand your idea — but you should still be listening carefully because you may learn valuable insights. If you are speaking with a bunch of smart people and a similar thread emerges, there’s something to that thread and you should pay attention to it. Be wary of confirmation bias. It’s only natural that an entrepreneur wants to hear that their idea is great, but you don’t want people telling you that because it doesn’t help you. The questions you should always ask are: What’s wrong? What’s broken? Why won’t it work? What do you think the risks are? People by default will want to give you good feedback rather than bad, so you have to ask negative questions. As a platform for changing the world of work and enabling individuals, jobs is one important application built upon LinkedIn’s professional network — but it’s not the only one. We believed the general discovery of people would be really valuable, which is why we say “LinkedIn is not only about jobs” in the slide above. The purpose of this slide was to show that we were focused on the recruiting industry as a key market, but we were nervous about being pigeonholed as a job listings site. Among Silicon Valley investors, Monster and HotJobs were not considered great, investable businesses — even though Monster had a $4B market cap — because of the constant amount of churn for jobs listings. What’s more, the sales and marketing costs of acquiring listings are expensive. Take competition against your potential revenue streams seriously. Being detailed about your competition, especially listing the specific companies, helps increase investor confidence. Identify the right metrics for success. Focus on revenue and activity rather than market cap or Total Addressable Market numbers. Although we had some real growth in a month, we had no revenue, so our numbers were not yet impressive. However, by highlighting revenue and growth as the most important success metrics in the recruiting space, we proved that we were serious and thoughtful about the space and showed that we understood the metrics that matter. Above is the mockup for the subscriptions product, then called Network Plus. Rather than just saying we would have a product that does X, we wanted to show a specific product idea, backed by market research, that was tangible in detail. Again we used quotes to show folks who were already finding this value proposition useful. 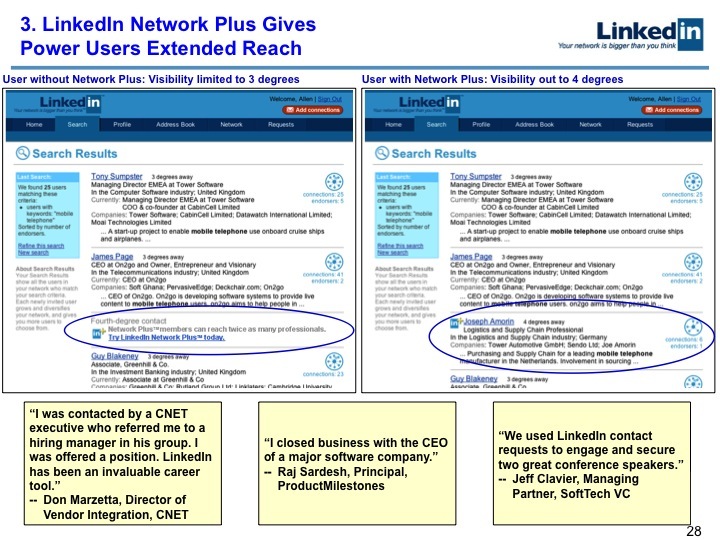 What we also showed in this slide was that even though every LinkedIn member had the ability to search, there was a difference between free and paid accounts. We were underpromising and overdelivered, ultimately giving paid accounts visibility of the entire network. Today, LinkedIn Premium subscriptions provide more powerful tools — such as contacting anyone with InMail Messages and the full list of who’s viewed your profile — to easily find, contact, and manage the right people for their professional needs. Designing the subscription product this way created more value for our members, which made the network itself more valuable. The number one value for the entire history of LinkedIn has been “Members first.” Even while building the subscription product, it was important to have a product that worked for subscribers and members. Underpromise and overdeliver. Internally, our team expected that paid members would potentially get access to the whole network, but we had to make sure that the network would be comfortable with this. So we showed four degrees to our investors, to be sure. Show that you’re paying attention to the market. Instead of merely saying that we knew product-market fit is key, we wanted to show that we did the work. We used quotes to show that we were talking to credible individuals struggling to solve our problem who were giving us feedback on our products. There are other methods, of course, such as graphs and data. But if we’d simply said, “We’re focused on product-market fit,” that doesn’t show, that tells. Because Network Plus was going to be a subscription service, we were worried that an investor might point out that this was not how Monster’s job listings worked at the time. As a comparable, we point to the market for personal dating — which has a similar value proposition to professional networking — because it uses subscription services and has large dollar spend. Subscriptions was one of the major business models we pitched, but in 2004, few investors believed subscriptions would work. Most investors saw the internet as an advertising medium, even today. 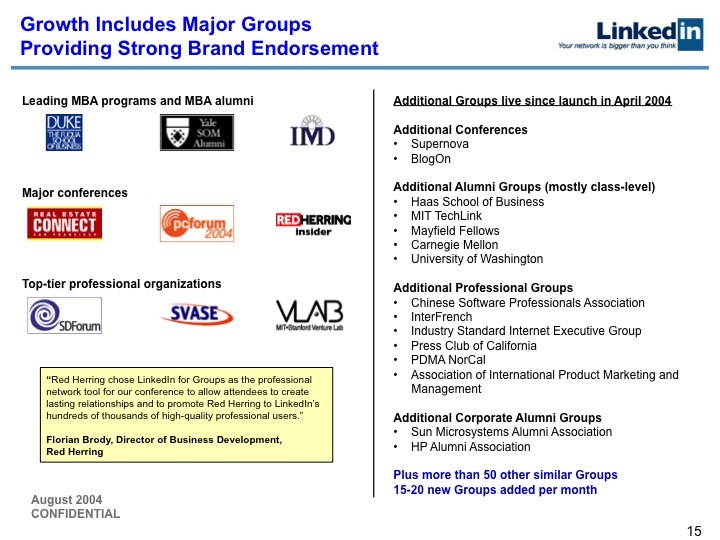 LinkedIn is one of the companies that has proven that subscriptions can work for consumer internet products. One of the virtues that entrepreneurs get from talking to many investors during the financing process is a wisdom of crowds that helps you figure out what the real risks are. When I was pitching SocialNet (my first startup company which was a dating service similar to Match.com), what I heard from numerous investors was this concern: “If someone uses SocialNet to find a partner and succeeds, then they’re no longer a customer, which means you intrinsically have a massive churn problem.” As it turns out, that signal was absolutely right. Listing businesses have to solve this churn problem by figuring out how to have lifelong customers, which is always a target for great businesses. Again, we address revenue to build confidence that a business will come. We did listings first because it shows all members the value of the network. Next, we did subscriptions with a focus on HR/recruiting/jobs because we realized that was what people primarily used our search for. We also figured out that subscriptions would be the market entry strategy for our recruiting product. LinkedIn has such a valuable, aspirational user base that the subscriptions product isn’t just popular with jobhunters, it’s popular with business developers, journalists, venture capitalists, networkers, and more. As I said earlier, we never launched InLeads. What we discovered while thinking through the search ads product was that people aren’t looking for people who are advertising to them; they’re looking for the people they’re trying to find. So we only got to doing self-service advertising much later. In the meantime, we reserved a space with brand advertising. Be decisive and ship. Including specific dates, for example, shows decisiveness. Being decisive doesn’t mean that you have to stick with your decisions. Good investors expect you to iterate often as you figure out what product will grow your market. Greylock didn’t mind that we didn’t follow this timeline closely. What mattered was that we made progress, while being definitive about our company’s playbook and demonstrating an ability to make difficult decisions. While it’s important to think carefully about your future, don’t think too far into the future. You will change, the world will change, and the competitive landscape will change. It is useful, however, to have a strategic direction supported by confident projections. After all, successful businesses outdo their competition by better anticipating long-term strategy. Finally, we get to part of our investment thesis. We have virality and growth for a professional network, and we have revenue that can come through three patterns. Because we have viral growth and digital goods, we can have high operating margins. And the hardest part is establishing the network which then has network effects as a platform for valuable businesses. That’s the essence of our pitch, which we should have stated at the beginning. Be wary of adjectives and especially adverbs. Anytime you use qualifiers like “very”, you’re overstating your point, which shows that you’re nervous about it. When I’m being pitched as an investor and I see such qualifiers, I make sure to ask questions about those areas because I know the entrepreneur is most nervous about them. In this slide, I should have used “high” instead of “very high”. As you know, we were nervous about the path to revenue, and this showed that nervousness. The key issue we were steering into was whether we had a business or not. Have reasonable numbers and assumptions that can pass the blink test during the pitch. Investors want to make a quick assessment that you have an intelligent view of the model of your business, and they know those assumptions can later be validated by due diligence. You don’t want investors to fixate on claims that appear crazy. Sometimes, in Series B pitches, a slide like this would be an appendix slide. As a matter of fact, for the vast majority of our presentations, we didn’t spend any time on this slide. Credible investors were glad to see it because the slide showed that we were thinking about the revenue question. Again, we were nervous about getting the financing past the lack of revenue so we kept shooting at it from different directions. Here we’re saying, “Look, with a Series B we can get to operating profitability,” which, by the way, we did. In fact, when LinkedIn received the HBS Award in 2010 for Entrepreneurial Company of the Year, our Series A investor Mark Kvamme showed that with a one-year delay (which we deliberately did to grow the network) we closely followed the revenue model we gave in our Series A. That almost never happens with Series A projections. A successful financing process obviously results in you raising capital for your company, but it also results in a partnership that delivers benefits beyond just money. For example, great investors can significantly boost the strength of your network, which helps in recruiting employees and acquiring customers. Great investors can also be a source of network intelligence, so you can better prepare for likely challenges and opportunities ahead. After showing what the market is and what you can do, now you can show the people who can make it happen — the key leaders of the team. After myself is Sarah, who made sure our operations could run to scale. Next was Allen, who showed experience in the social space. Jean-Luc showed deep technology capabilities. Konstantin showed startup experience and an understanding of product-market fit. Eric also showed deep technology capabilities, proving our technical chops. And Matt was a talented generalist who worked closely on this deck and financing process with me. Additionally, Matt came to the majority of the pitches. You have the most attention from investors in the first 60 seconds of your pitch, so how you begin is incredibly important. One common mistake is putting the team slide early in the deck. The team behind your idea is critical, but don’t open with that. Instead, open with the investment thesis. This advice applies to seed funding rounds, too. Yes, seed investors understand that early stage companies have many unknowns and the idea will change a lot, so they look carefully at the people to see whether the team will be able to adapt. But even at this stage, lead with your overall investment thesis. Persuade investors that your investment thesis is intriguing, then show who can make it happen. Because we had zero revenue at the time of the pitch, it was especially important for us to give our investors confidence that our team would execute. To this end, we made sure to include both a thorough slide of our team and a thorough slide of the broader network of investors and advisors backing the company. One benefit of going with top-tier venture capital is that they tend to have good prediction track records, which helps establish credibility for early stage businesses. 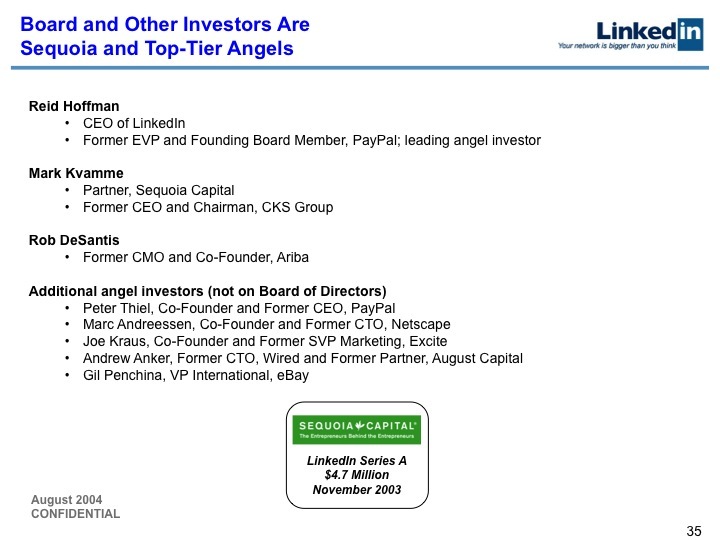 Given that Sequoia Capital is a top-tier VC, we gave Sequoia prominent placement (including their logo) on this slide. As a partner at Greylock, I’ve encouraged my portfolio companies to do the same with Greylock. People frequently say that you should work your way up to the investors you most want to work with. Instead, identify the investors you most want and the investors who are most likely to say yes. These are not necessarily the same people (though it’s excellent if they are). Approach your likely investors and your ideal investors at the same time, because your likely investors provide a temporal forcing function by which you might end up with your ideal investors. Although I had identified David Sze and Greylock as the investors I most wanted, I pitched another firm first. They responded by rolling in with an offer before I pitched Greylock. Since David and the partnership at Greylock knew I had an offer, they gave me a term sheet the day after I pitched them. Stay aboveboard so you keep trust with prospective investors. I was forthright with the first venture firm about my intentions, telling them that they received the first look, and that I would talk to a few more firms to put time pressure. And Greylock knew I had gotten a term sheet to accelerate their decision process. Naturally, the first firm was disappointed when I turned them down, but they weren’t surprised. While they worried their early offer would be shopped, sometimes firms end up getting the deal that way, or sometimes they get to participate in the deal because of their early offer. Investors know that smart entrepreneurs intend to get a good term sheet early, but they have to try to win the deal. As we’re wrapping up the Series B pitch, we wanted to remind investors that we spent the $4 million from our Series A and accomplished a lot, to increase their confidence in giving us $10 million to turn the next card. When you’re starting out, you want to show investors that you can build into a great business, which sometimes leads to hyperbolic statements. It’s okay to be hyperbolic, to be aggressive, to be visionary. Avoid adverbs and adjectives when possible, but you want to show that you have strong forward motion. In this pitch, we wanted to show that we believed this would be a huge, valuable platform. In the end, what matters to investors is that the investment turns out well. The reason we reused this slide from the beginning of the presentation was to indicate the end of the presentation, while returning to the high line of how to conceptualize the business and reminding investors of the value proposition. We left this slide up on the screen while taking questions, so it served as a buffer for the appendix. The reason we didn’t keep an “Appendix” slide up was that we didn’t want investors to see that we had an appendix, requiring us to go through all our prepared slides. We were happy to go to the appendix, but we only wanted to get to it if we were asked the pertinent questions. You should end on a slide that you want people to be paying attention to. 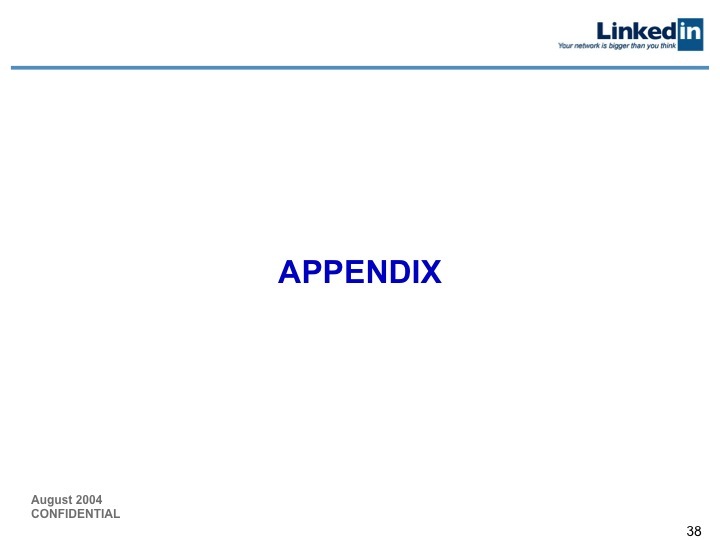 A placeholder slide that says only “Appendix” or “Q&A” is never that. Instead, close with your investment thesis. We should have blended this slide with the previous slide (#36) to end on one investment thesis slide, which would be left up on the screen while answering questions. You want that slide to remind your investors why they should invest in your company. I now believe you should begin and end with the investment thesis. The beginning is when you have the most attention, and the end is when you should return to the most fundamental topic to discuss with your investors. Plus, as you talk about the investment thesis, you learn from your investors how to improve it. Smart investors should add to your thinking about the investment thesis. Our presentation included five appendix slides, which we’ve omitted for brevity. 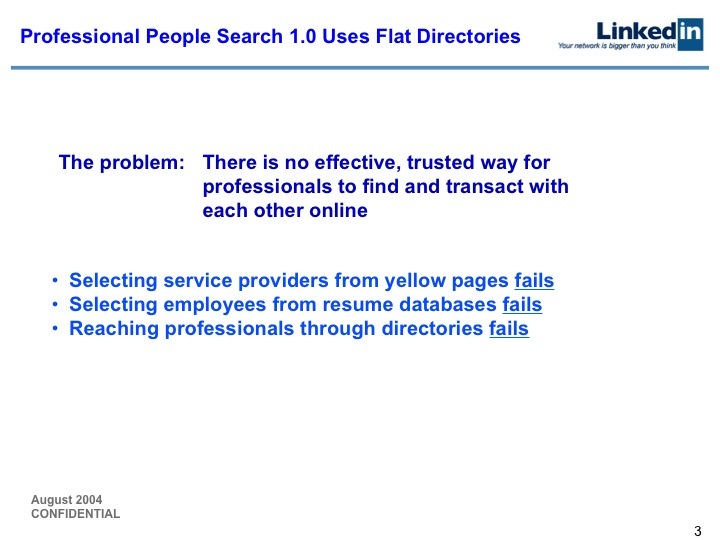 This slide showed a mock-up of what a professional search product could look like. This slide addressed the question: “Isn’t social much more valuable than professional?” We showed how the two domains work differently. This was particularly prescient when Facebook came along. Social versus professional as categories took a long time to establish, but even then with Friendster and others, the two domains work differently. We showed this slide to address the assumptions behind our financial models going to profitability. This slide was in case investors focused on advertising, since we had led the presentation with that and many investors assumed that consumer internet companies required advertising models. 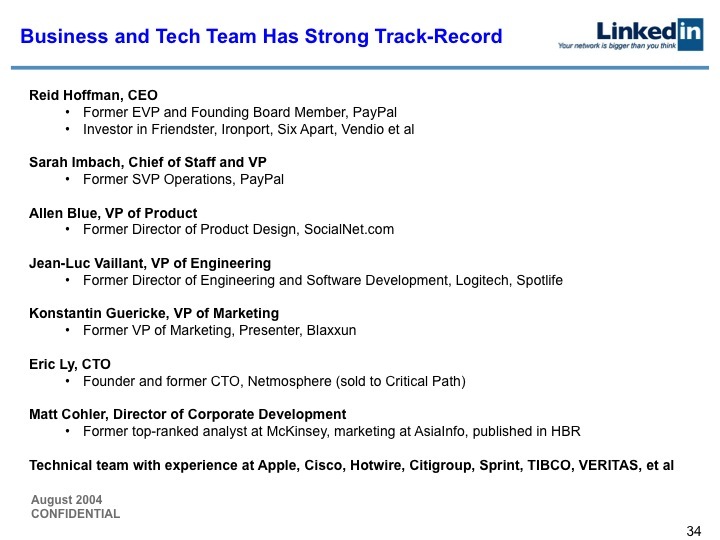 Fortunately, we almost never used the slide because smart investors like Greylock picked up that there was an HR space. 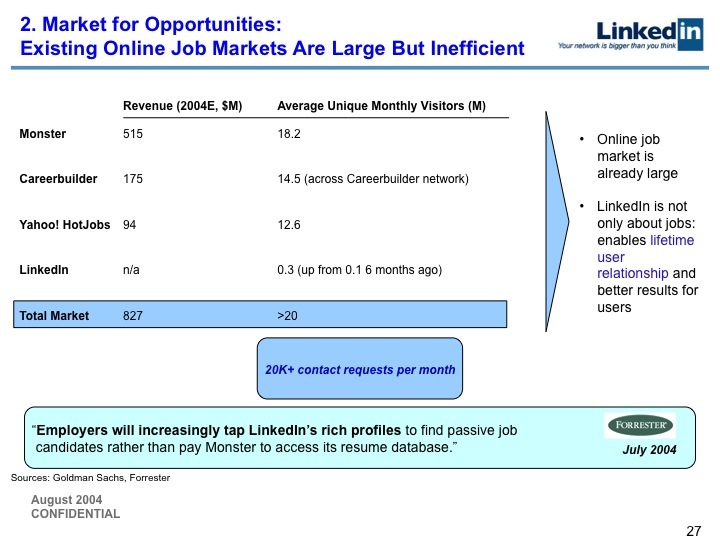 This slide showed how LinkedIn’s Opportunities model would improve the traditional job site model. You don’t have to have an appendix, but if you anticipate serious questions from the kinds of investors you want, preparing appendix slides with structured answers is impressive, showing that you’ve considered all of your business’ challenges, opportunities, and comparisons. Appendix content typically fall under two categories: providing additional information or addressing objections. 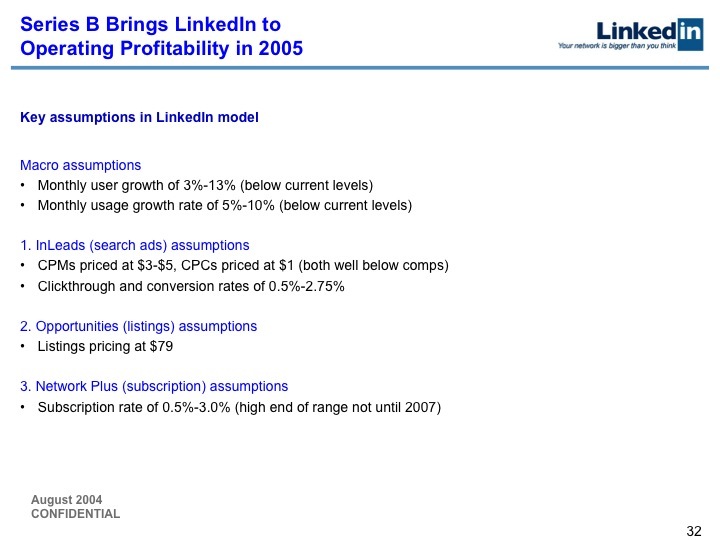 Today, LinkedIn seems like an obvious investment to have made in 2004. 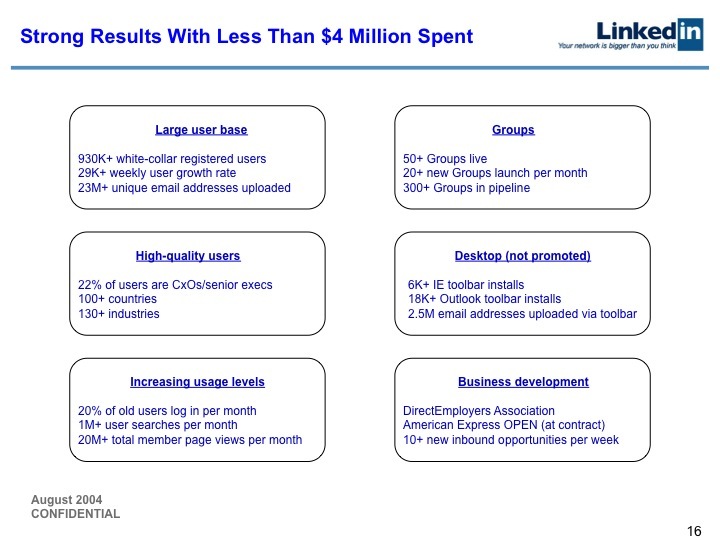 But at the time of the Series B financing, LinkedIn had spent its $4 million from Series A building a network that was much smaller than Friendster, MySpace, etc. We had no revenue, or even revenue-capable products. The journey from founding, to multiple rounds of financing, to IPO, was not easy. All startups go through real Valley-of-the-Shadow moments, in which they wonder why they ever thought their business was a good idea. At LinkedIn, we had these moments. As an entrepreneur, I found David Sze and Greylock to be a tremendous ally through the process. And, David had the vision to invest in LinkedIn when it looked to most of the investing community like an odd niche. How did I get Greylock on board in the first place? It started with this pitch deck. A good pitch helps get great investors, because it builds a strong relationship through clear communication and vision. So good fortune building your own pitch deck. And I hope it marks the start of an exciting entrepreneurial journey. We changed some of the text to be less hyperbolically ambitious on slides 9, 12-14, 18, 19, 31, and 36. A public company should avoid publishing forward-looking projections and ambitions — even if they’re from 2004. As an entrepreneur pitching a private company, it is of course critical to be forward-looking and ambitious. Thanks to Ian Alas and Ben Casnocha, among others, for their help and feedback.